The DB11 Volante has a single-piece aluminum hood. LONDON -- Aston Martin has launched a convertible version of its DB11 coupe with a Daimler-sourced V-8 as the sole engine option. The decision not to include the DB11 coupe's V-12 was made to keep the weight low, an Aston Martin spokesman said. The DB11 Volante is 26 kg (57 pounds) lighter than the DB9 Volante, which it replaces. It has a fabric hood made from eight separate layers. The hood takes 14 seconds to lower and can be operated at speeds of up to 50 kph (31 mph). Once folded into the trunk, there is 20 percent more space for luggage than in the previous car, Aston said. The Volante’s 4.0.liter twin-turbocharged engine is the same as the V-8 offered with the DB11. The engine is supplied by the Daimler’s AMG performance division. It makes 503 hp. Aston expects DB11 sales will be split 50/50 between the coupe and the convertible, the spokesman said. The DB11 Volante's largest market will be the U.S. Deliveries begin in the first quarter of next year. Prices will start at 159,900 pounds ($212,500) in its UK home market, 15,000 pounds more than the equivalent V-8 coupe. U.S. pricing will start at $216,495. The DB11 coupe's V-12 engine weighs 115 kg (254 pounds) more than the V-8. 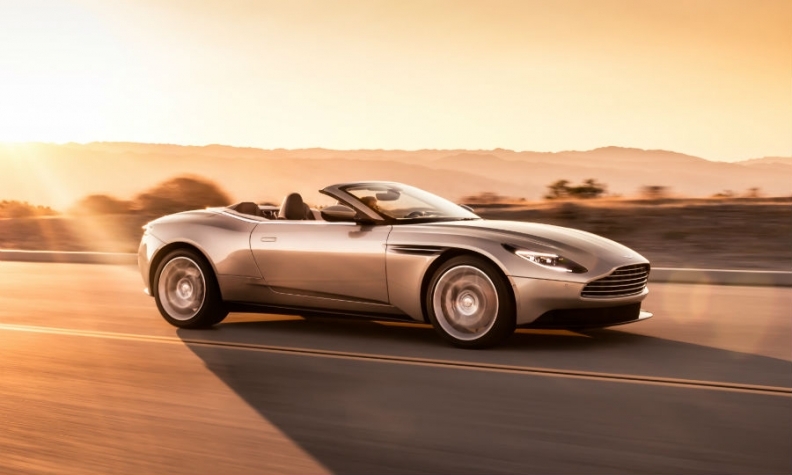 Using only the V-8 in the DB11 Volante allowed Aston to offset the extra body stiffening convertibles need to reduce extra flex caused by the loss of the metal roof.